Hello there and thank you for stopping by today. 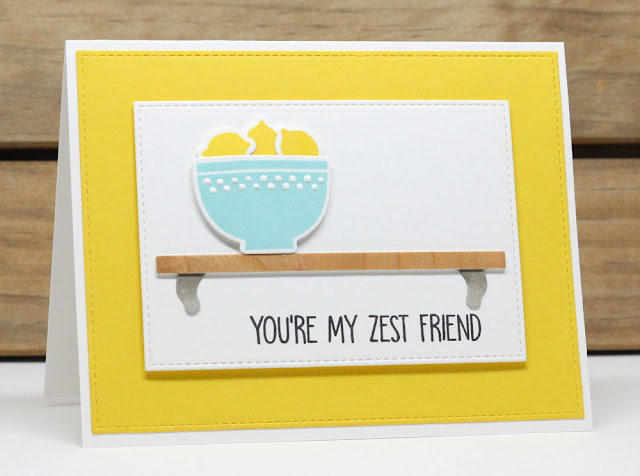 Today is the second day of the MFT Kitschy Kitchen Card Kit Countdown. Only 22 hours until the new release (yay)! Be sure to head over to the MFT Blog for the full kit reveal. My card today uses Kitschy Kitchen Stamp Set, You Bake Me Happy Stamp Set, and two of the ink cubes in the kit. This new card kit will be available for purchase in just 22 hours, on November 15 at 10 PM EST. Be sure to check out the MFT Blog to see what the rest of the team has come up with today. Really bright and fun! This kit has great potential. Lemons rule- you've shown them off beautifully! Jody--Love the yellow and lemons! So uplifting! Great card! Your color palette is just beautiful! Great work there!